Cruise along the rugged coastline of the Tasman Peninsula and see caves, arches and amazing rock formations that can’t be seen from land. If you are coming to Tasmania for a short stay or a long weekend and don’t have enough time to do extensive hikes, a boat cruise along the coastline of the Tasman Peninsula offers a great alternative to see the National Park from a different perspective. You will get to explore hidden caves, fascinating sea stacks and a variety of marine life. This month, we offer a last minute special for all bookings in June. Save 5% on our Coastal Adventure and our Seal and Ocean Expedition! Select the tour you would like to join, choose a date on the booking calendar and enter the Promo Code JUNE17 when you are prompted to do so. Alternatively, you can send us an email or give us a call and mention the Promo Code JUNE17. 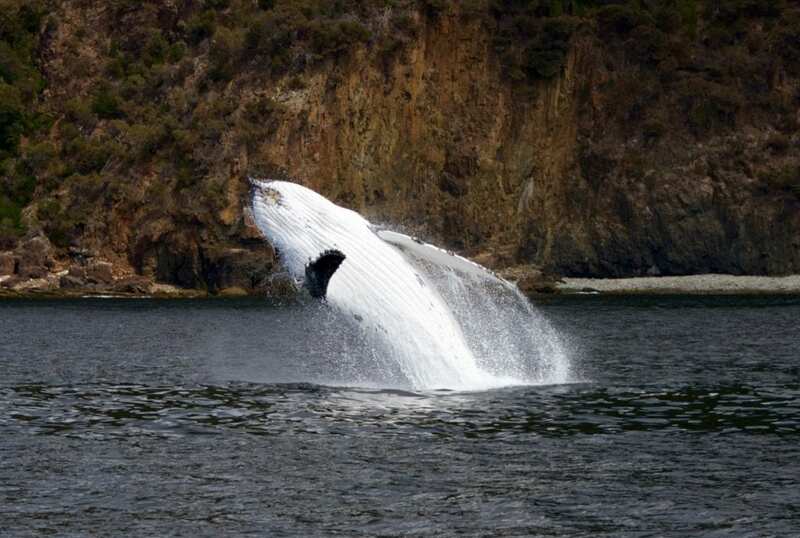 Check out the local marine life in their natural environment on one of our cruises. These are large Bottlenose Dolphins that came up for a play. 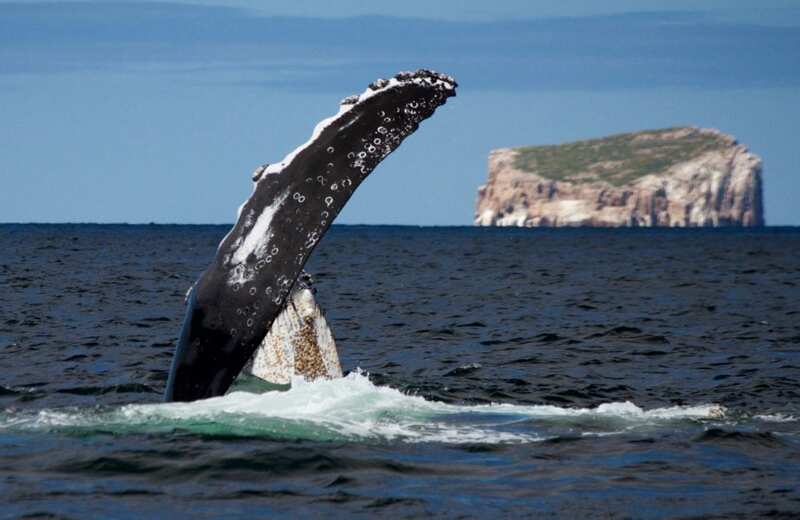 June is a great time to visit Tasmania, since the main tourist season has come to an end. Our afternoon ‘Coastal Adventure’ tour is the perfect choice for photography enthusiasts that would like to capture Tasmania’s amazing scenery just before sunset, when the coastline lights up in beautiful colours. The visibility underwater is amazing, specially during the cooler months. 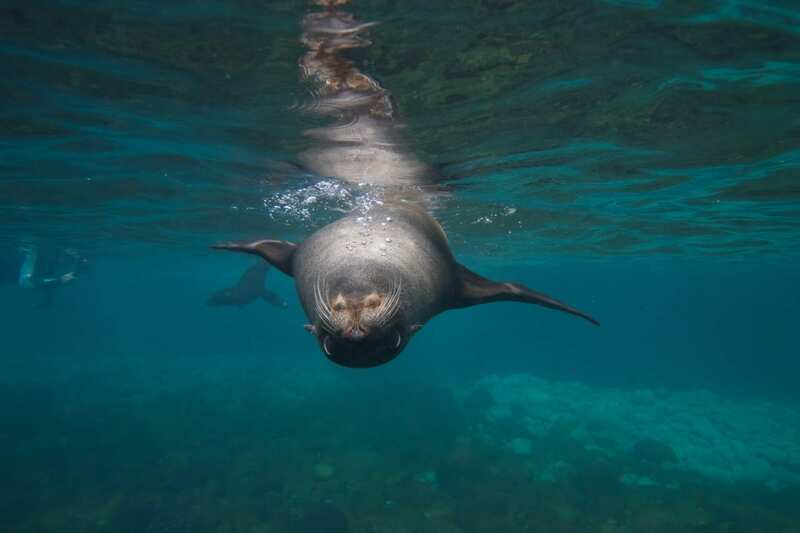 And for those tough wildlife lovers: We still operate our Seal & Ocean Expeditions, that will give you a litte insight into Tasmania’s underwater world and the life of Australian and Long-nosed Fur Seals. One bonus of joining our snorkel trip during the cooler months is: The water clarity on calm days is just breathtaking! No need to worry about the cold, our polar fleece onesies and drysuits will keep you toasty warm! 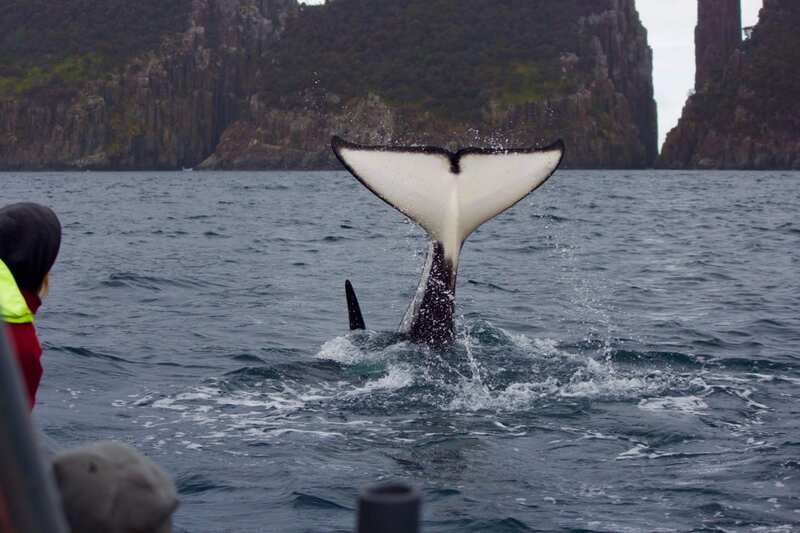 The large number of Orca sightings last month plus numerous sightings in January, February and March have proven that Tasmania’s East Coast is one of the hotspots to see Orcas in Australia. Lots of Orcas have been sighted on Tasmania’s East Coast early 2017, particularly in April. 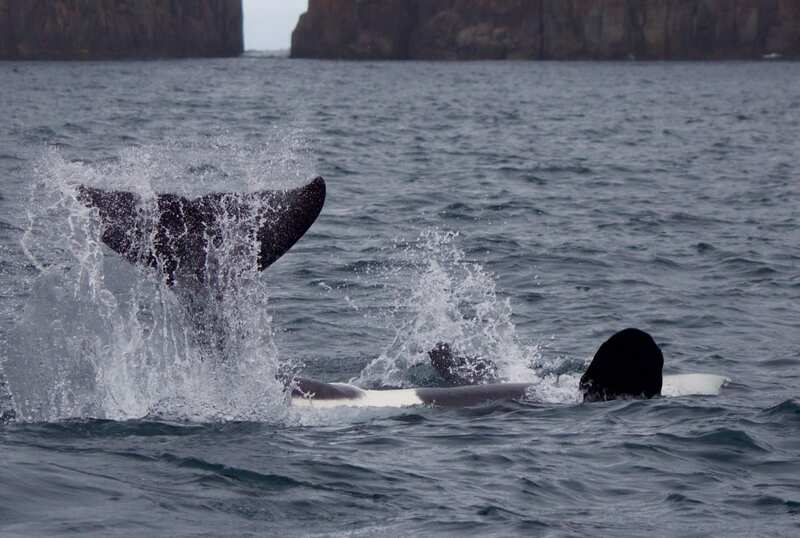 Tassie is one of the hotspots to see Orcas in Australia. Watching the sun set and the moon rise from the water is a beautiful sight – And to see the big dorsal fin of this male Orca appear underneath was just like being in a dream!! Where to report Orca sightings? Orcas can often be seen from the shore. 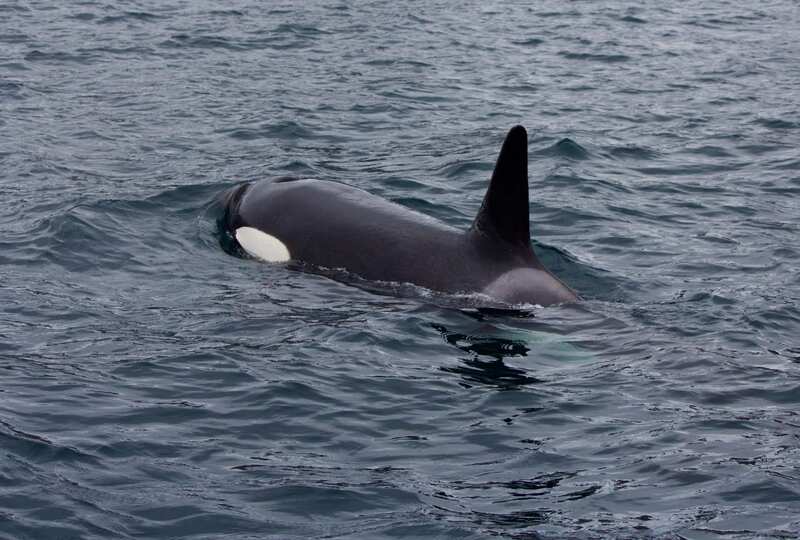 If you do see an Orca, please report it either to us at Wild Ocean Tasmania (0473-770416) or to David Donnelly of Killer Whales Australia (0401-011022). Your contribution would greatly support the team of researchers in gathering information about the behaviour and distribution of Orcas in Australia. 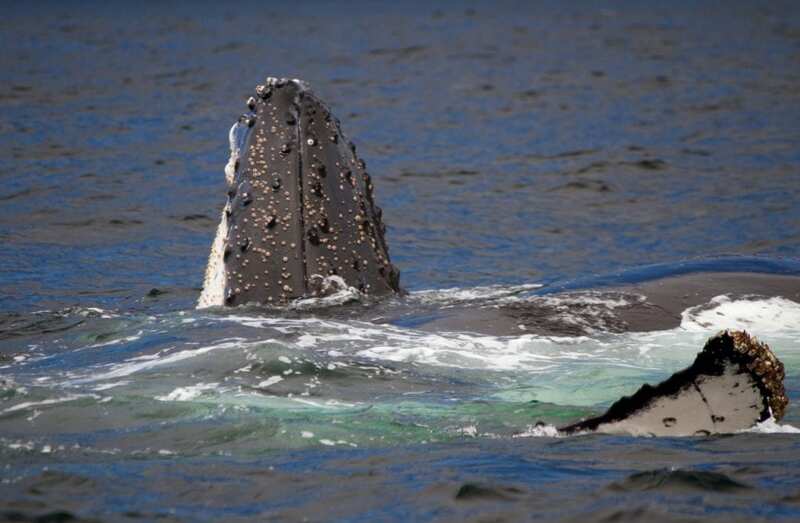 The last thing we would have expected to see on our Coastal Adventure last Wednesday was a baleen whale… While Humpback Whales can be seen on our coastline almost daily between October and December and Orcas, who belong to the family of toothed whales, are frequent visitors to Tasmania’s coastal waters all year round, other species of whales are not that common inshore. A misty blow of a baleen whale appears amongst hundreds of Bottlenose Dolphins. We stopped our vessel to enjoy the company of a huge pod of about 500 Bottlenose Dolphins as a large misty blow appeared in amongst all the action. No need to explain how excited we were! 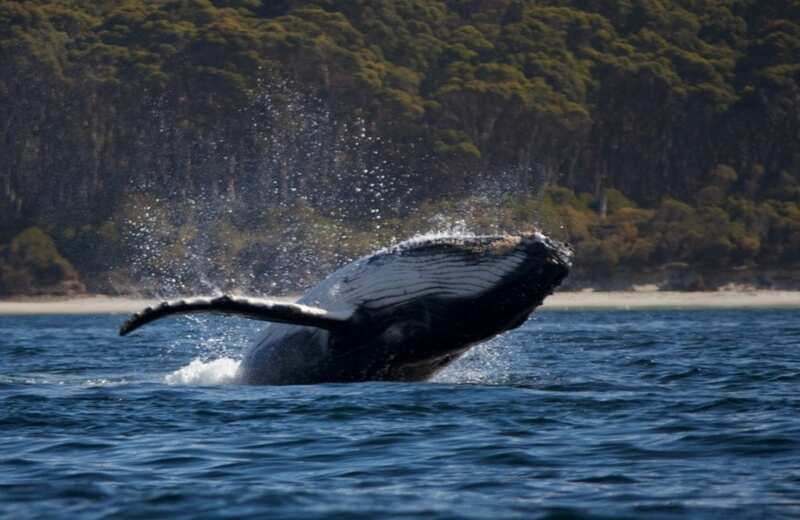 It was obvious that this species of whale was a rare visitor to Tasmania’s coastal waters. 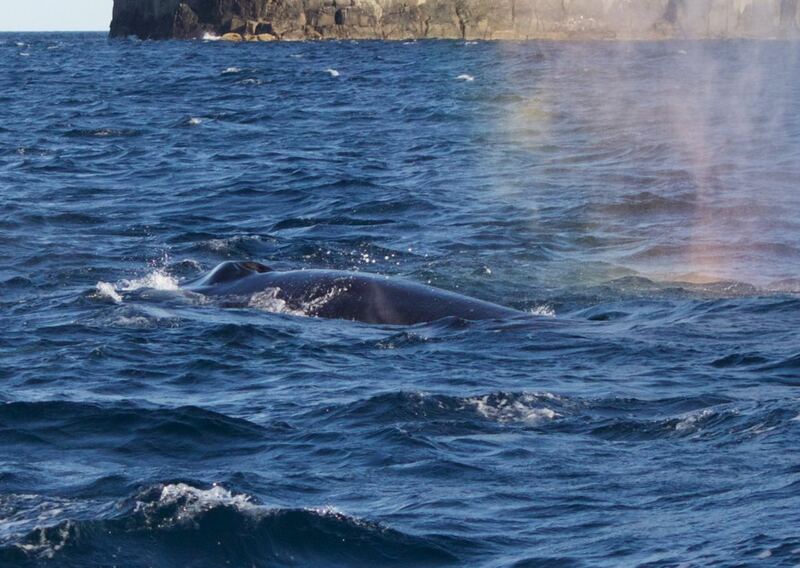 Fin Whales belong to the family of baleen whales which have two blowholes. Their blow can therefore easily be distinguished from toothed whales which only have one blowhole. Sei Whale or Fin Whale? We quickly grabbed our camera to hopefully get some ID shots. The sickle shape of the dorsal fin, the dark bluish-grey colour of the dorsal surface when looking against the sunlight, the blow and the size of this animal (about 15+ meters long) all indicated that it might be a Sei Whale. But the turquoise colour when below the surface confused us a little. 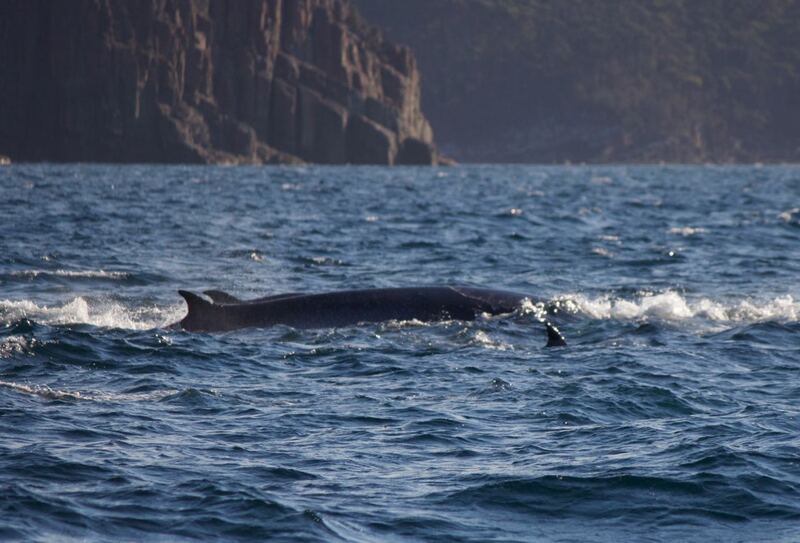 The animal appeared to maybe even be a Fin Whale, the second largest living animal on the planet. Fin Whales make the lowest frequency sound in nature which can be heard by other Fin Whales thousands of kilometres away. Pretty incredible!! Both the Sei Whales and the Fin Whales are listed as endangered. They have been excessively hunted for their meat, blubber, oil and baleen during the commercial whaling time. 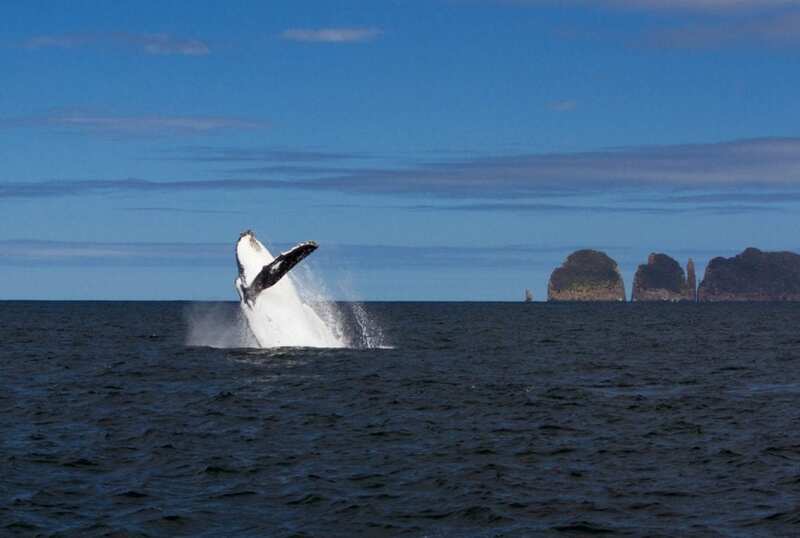 Recent surveys indicate that there are now fewer than 15,000 Fin Whales in the Southern Hemisphere and around 40,000 in the Northern Hemisphere. The current population of Sei Whales is estimated at 80,000, nearly a third of the prewhaling population. The light turquoise colour of this whale when below the surface confused us a little, suggesting it might even be a Fin or Blue whale. UPDATE: According to the team of the Marine Conservation Program Wildlife Management Branch of DPIPWE and their interstate colleagues, the general consensus is that it was most likely a sub-adult Fin Whale, Balaenoptera physalus. The turquoise colour beneath the surface indicates a Blue or a Fin Whale, but the size and position of the dorsal fin rules out the Blue Whale. Also the straighter anterior edge of the dorsal fin is unlike most Sei whales. Very few sightings of this species have been confirmed in Tasmania. Fin whales are typically found in deep offshore waters. So thanks to everyone involved in helping with the identification!! This photo shows the dorsal fin of the Fin Whale in the middle compared to the dorsal fins of two Bottlenose Dolphins on either side. The straighter anterior edge of the dorsal fin is unlike most Sei Whales. If you would like to join us on our Coastal Adventure tour, click here to check the availability. We offer great deals for families, plus children under 6 years of age travel free of charge! This young Killer Whale slapped it’s tail only a few meters away from our boat. Wild Orca frolicking in Tasmania’s temperate waters. The teenage Orca was very inquisitive. He came over and played beside our boat. We watched him roll around upside down, checking us out from underneath. Then he accelerated to grab and bite a jelly fish in half, what he then celebrated with lots of tail slapping. All within meters of our boat. Researchers still don’t know much about the behaviour of Killer Whales in the wild. Their aim is to identify individual animals and to find out more about their diet and distribution. 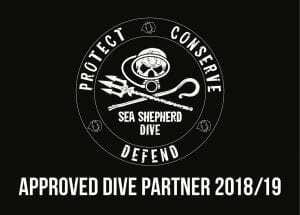 We work closely together with Killer Whales Australia, an organisation dedicated to the conservation of Orcas in Australian waters. Killer Whales can be identified due to their dorsal fins (distinctive shape, nicks and scratches) and their saddle patch (the area just behind the dorsal fin). We try to get high resolution photos of these areas to send off to the Australian Orca Database for their ID catalogue. Researchers are also hoping to collect skin and tissue samples of the Orcas from aboard our vessel, using a modern biopsy method, which can help in identifying their precise diet. 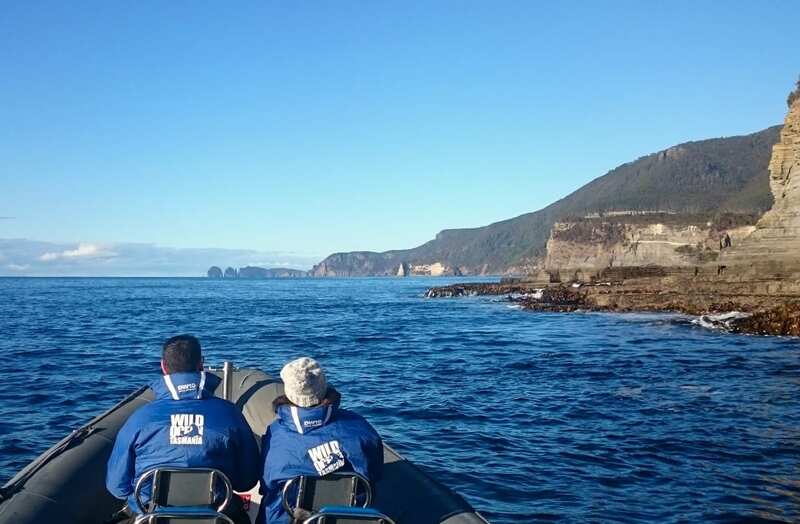 If you would like to be a part of what we do and support ocean conservation whilst enjoying the spectacular coastline of the Tasman National Park, check out our 2-hour Coastal Adventure or half-day Seal & Ocean Expedition and reserve your seat today! Last week has been amazing in terms of wildlife sightings. Not only have we been treated with some more Humpback Whales that were feeding off the Tasman Peninsula, but we also got to spend our day with a superpod of Bottlenose Dolphins in excess of one thousand animals last Thursday. 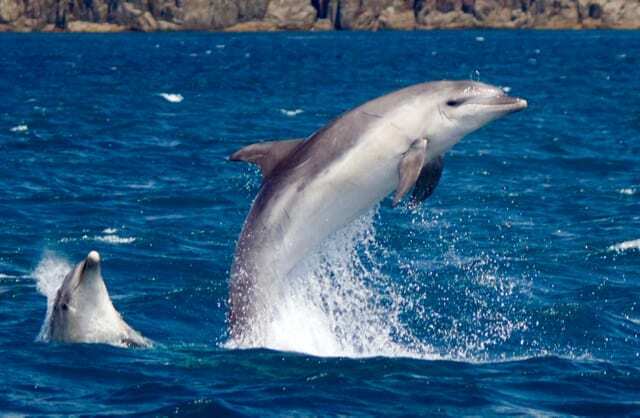 Bottlenose dolphins often accompany us on our boat trips and like to show off with amazing displays. Dolphins as far as we could see! 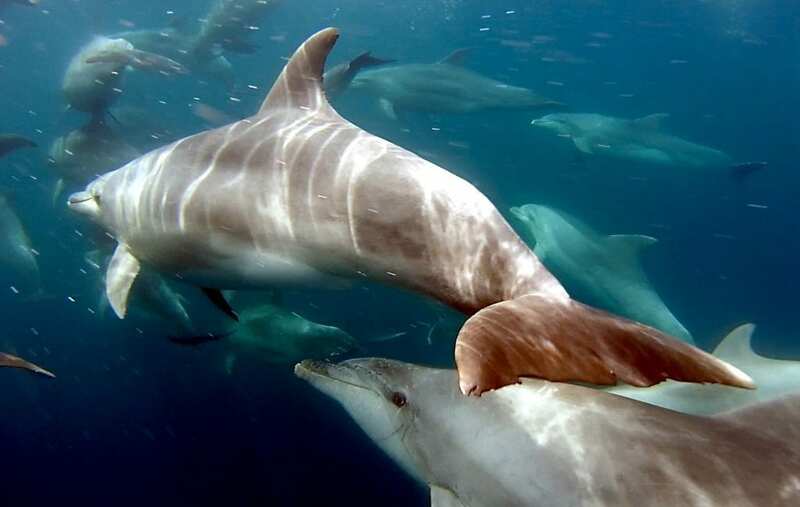 Superpods of dolphins generally occur in areas of high food availability and consist of up to a few thousand individuals. 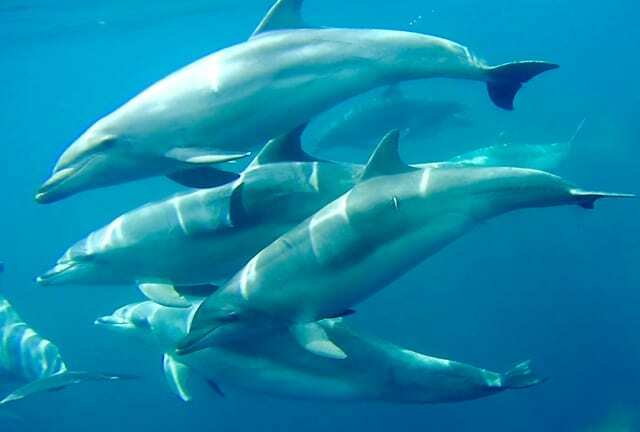 In comparison, an average dolphin pod has about 10 – 30 members. 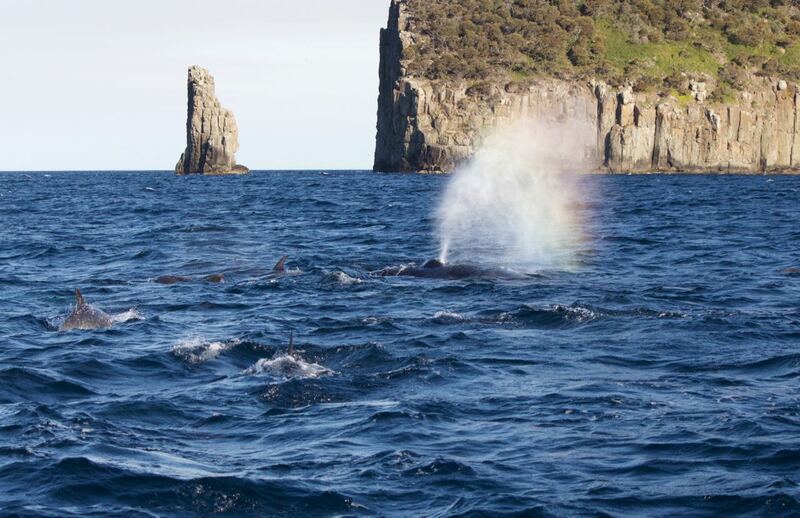 The temperate waters of Tasmania are rich in nutrients and therefore provide the food that attracts whales and dolphins to feed here. Listening to the whistles of dolphins and watching the acrobatic jumps is a treat for all your senses. 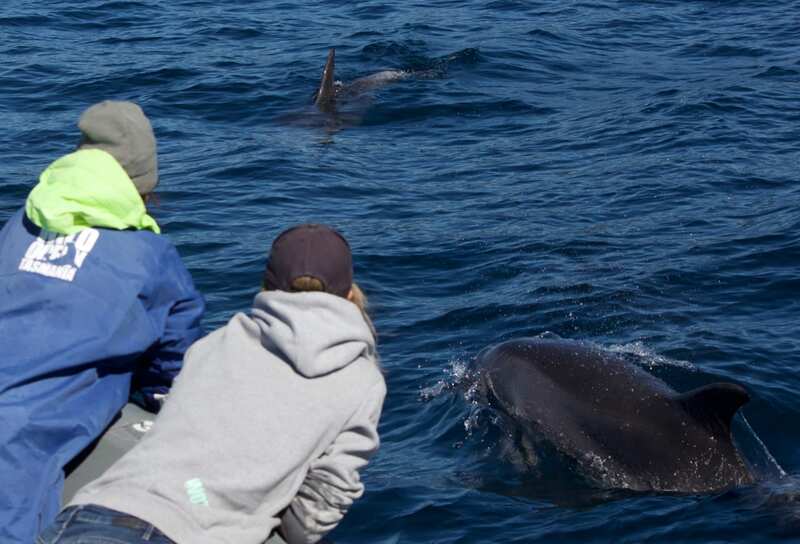 Seeing a superpod of dolphins is a treat for all your senses, as they communicate through whistles and body language. The whistling sounds which the animals produce are easy to hear from the boat. Dolphins produce sounds using air sacs near their blow hole. The action of these air sacs is similar to filling up a balloon and then squeezing the end to let out the air. Each animal has a uniquely identifying signature whistle. Examples of body language are spectacular leaps out of the water, the snapping of their jaws as well as tail and head slapping. Sounds and gestures help the animals to keep track of other dolphins in the group, to navigate and to point out nearby food. On some lucky occasions we even get to see dolphins swim past our sea-view platform. What an amazing experience to look a wild dolphin in the eye! To see dolphins always puts a smile on your face! Probably because of their friendly facial expressions. If you would like to join one of our wildlife-watching tours, check out our scenic based Coastal Adventure trip or come and swim with seals! We would love to share this beautiful coastline with you! What a great start into the season it has been this week! 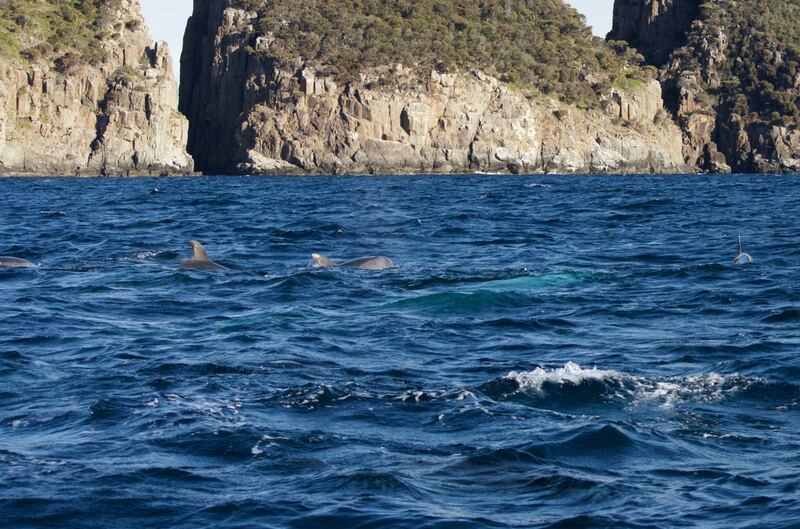 On our second day of operation we came across a pod of about 100 Dusky Dolphins off Waterfall Bluff. 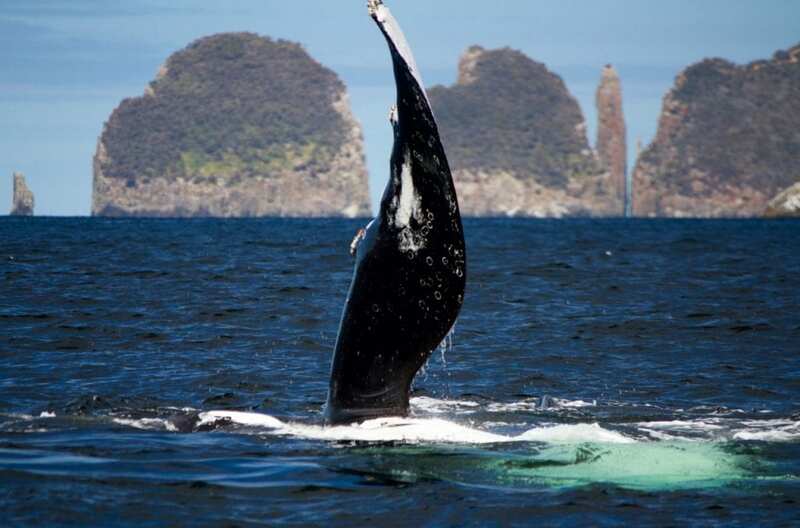 These beautiful animals are known for their acrobatics and they have certainly put on a show for us! Dusky Dolphins are a curious species. We experienced a very inquisitive behaviour. Once the dolphins became aware of our boat, it was obvious that they enjoyed our company and loved to hang around for a play. Dusky Dolphins are found throughout the Southern Hemisphere preferring cold, coastal waters. The best known locations include New Zealand, south-western Africa and also South America and southern Australia. 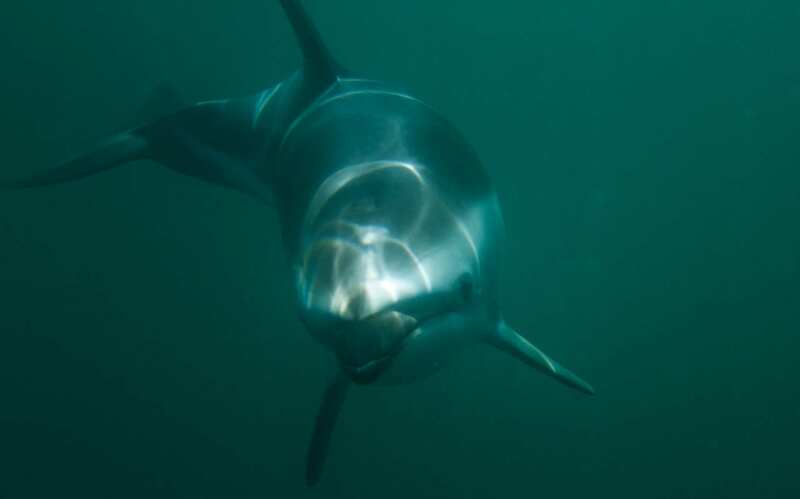 Within Australian waters, dusky dolphins have been recorded in colder waters off Kangaroo Island, eastern Tasmania, and Bass Strait. 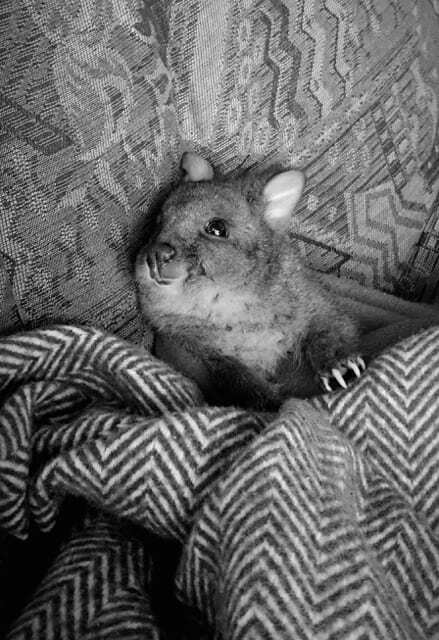 However, the numbers of confirmed sightings in Australia seem to be low. Dusky dolphins are beautiful looking creatures with an amazing pattern. They are blue-black in color on their upper sides and have a dark band running diagonally across their flanks from their dorsal fins to their tails. They also have 2 white streaks that run diagonally from their tails to the base of their dorsal fins. Their under sides are light grey to white in color. These dolphins are relatively small, growing up to 2 meters in length. A very distinctive feature is the evenly sloping head from the blowhole to the tip of the snout, which lacks a beak. 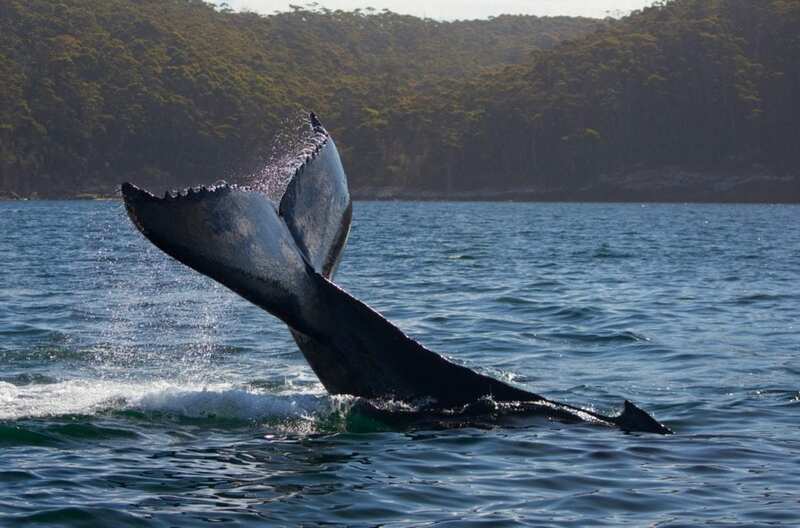 If you have sighted unusual marine mammals or any species of whales in Tasmanian waters, please report the sighting to the whale hotline of the Parks & Wildlife Service Tasmania (0427-WHALES) or to us at Wild Ocean Tasmania (0473-770416) to assist in marine research. From 4th to 6th November 2016, Rob Blakers from Wild Island Tasmania will be conducting a special photography workshop on Tasman Peninsula with wildlife photographer Matthew Jones and Tasmanian landscape specialists Loic Le Guilly. For more information about the Wild Island Photography Workshop on Tasman Peninsula please click here.